I’ve started doing some book editing for Robert Rose publishing, and as a bonus got a chance to try out one of their many excellent cookbooks, Preservation Society Home Preserves, by Camilla Wynne. Peaches are at the top of my list of favourite fruits (along with strawberries), and with peach season in full swing, I wanted to go beyond making the good old peach jam I do every year. So I tried this book’s Peach Melba recipe, on page 86. How divine is a combination of raspberries and vanilla in syrup, poured over fresh peach halves? 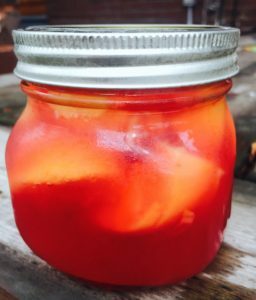 You can enjoy Peach Melba through the winter months as dessert, or use it right now in this hot late-summer weather: I have some in my freezer as I write this, and will blend it up for some frozen Bellinis for a dinner party this weekend. Halve about 16 small peaches, either peeled or not (I left the peel on), and simmer them in the syrup until warm. Transfer them into your hot prepared canning jars, packing them gently but leaving about 1/2 inch of space at the top. Pour the hot syrup overtop to cover peaches, filling jars but still leaving that space at the top. Remove air bubbles, wipe rims and screw on lids. Process jars in a boiling water canner for 25 minutes. Note: I purposely didn’t include specific processing instructions here, because I think the Preservation Society can do that best–and you can find instructions for safe preserving online. Better yet, grab Camilla Wynne’s book. It’s full of other fresh ideas for preserving–Jalapeno Jam or Caramel-Crabapple Butter, anyone?